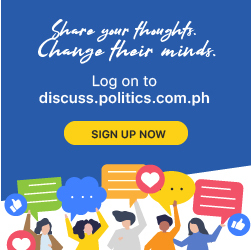 “[C]onnecting the money trail to Ms. Honeylet, using ‘veronica salvador’ was too WEIRD, primarily because WALANG NANAY na gagamitin ang pangalan ng kanyang nagiisang anak para malagay ang bata sa kapahamakan,” she said. Aquino said she’s speaking up to defend Duterte’s daughter because as a mother, she also saw her sons being bullied. “[K]ung bunso na nga ni presidente Duterte pwedeng magamit sa video, paano pa yung mga ibang bata? God bless us with more wisdom to know better & do better for our children,” she said. Despite being part of a political family, Aquino said her post has nothing to do about politics, but all about observing decency and respect for the rights of minors. Bong Go downplays Duterte’s threat to arrest critics: Sanay siya sa batikos!